If you’re wondering how to start a photography blog – or maintain or improve an existing one – there’s a whole world of tools and software you could use. So to give you some guidance, I’ve put together this collection of recommended photography blogging resources. Everything here is something that I use myself, or have done in the past, and so can recommend to you based on my personal experience. What’s more, I’m only recommending products and services that I believe can help you with your own photography and blogging. You can take a scroll through them all, or simply click the menu to jump to the photography blogging resources you need right now. What other photography blogging resources do you use? If you’re serious about your photography blog, WordPress is the only platform I’d recommend you create it on. Around 25% of the web is said to run on WordPress, which should tell you a lot about its versatility, reliability, and – perhaps most of all – its ease of use. Countless themes and plugins, both free and paid, make customising your photography blog quick and painless, and allow you to add pretty much any functionality you can think of. For full control over your site, and to be able to monetize it properly, you’ll need to use WordPress.org, rather than WordPress.com (or Blogger, SquareSpace, Wix, or anything else). If you do go with WordPress.org for your photography blog, you’ll also need a web host. From the many options available, I use SiteGround. Should you be new to blogging on WordPress, SiteGround have an installation wizard that makes it easy for you to get going. Alternatively, if you’re moving your blog over to SiteGround from another host, as I did, they can do this migration for you. Since I moved over to SiteGround, this site has gotten noticeably quicker, which is clearly important. I’m also enjoying a much easier-to-use hosting backend than I had to navigate before. SiteGround has a great reputation for their hosting and customer service and I’ve found both to be top notch since I started using them. You get a free SSL certificate for your site, which is essential now, and can take advantage of long term discounts when you sign up as a new user. If you want your blog to be a success, both the photography and the writing need to be as good as they can be. Achieving the former means post-processing or editing your images, and the software I use for this is Lightroom. There are a good number of reasons for this but, in short, nothing else I’ve tried is as intuitive, streamlined and capable of giving me the results I want with so few clicks. There are free alternatives, but I think paying for Lightroom (and Photoshop, see below) is worth the financial investment as using the industry leader will mean never wasting time learning new software in the future. Your photographs probably won’t be the only images you’ll have on your photography blog; they certainly aren’t on mine. For things like logos, post header images and Pinterest pinning images, I use Photoshop. Again, there are free alternatives that can do similar things, but I prefer to learn and use the industry leading software. Adobe’s Creative Cloud offers a Photography Pack that includes both Photoshop and Lightroom for around $10 or £10 per month. For the use of two great programs, including every update they ever release for them, I believe it’s well worth the money. You can get it from Amazon here or direct from Adobe here. If you’re going to be writing a lot on your photography blog, using some software to help you catch any errors you make is a good idea. I like Grammarly for this. In fact, nothing gets published on here without being run through Grammarly first. You can install the browser app and let it flag up your mistakes as you write, or you can go to the website and paste in your work after finishing the first draft, which is what I do. Hemingway is a free program you can use to make your writing more concise, highlighting things like overly long sentences, words with simpler alternatives, and too many uses of the passive voice; a handy tool to use especially when writing for an online audience. You can make the best photography blog in the world but if nobody sees it then what’s the point? Half the battle in blogging is getting your work in front of people’s faces, and Sumo has a whole suite of tools that can help you do that. Some of them are only available with a paid account, but some that you can use on a free account include social share buttons, a scroll bar that you can set with a call-to-action and a button, and heat maps that let you know how people behave on your site. There are plenty of other options for everything Sumo does, but I find it very handy to have so many tools all in one place. While the social sharing buttons from Sumo are great for getting your readers to share your photography blog posts, you should be doing the same on your own channels too. Scheduling this will leave you more time for your photography and writing, which is why I use Recurpost. This software used to allow you to recycle your schedule of up to 100 posts, until Twitter changed their rules and banned that practice. That meant RecurPost had to adapt, and now each Twitter post you schedule has to be unique – as they should be for the good of the platform. That change has turned RecurPost into a regular social media scheduling platform, albeit with one advantage that I can see if you like to batch process your work. You can still schedule up to 100 posts for free, whereas some competitors limit you to 10 on their basic plans. If you want to keep your readers coming back and maybe even one day buying something from you, having them on an email list is one the most important things you can do. When you’re starting out though, you probably don’t want to pay for all the advanced features most of them have. That’s why I went with MailerLite, whose services you can use for free until you hit 1001 subscribers. At the time, they seemed to be the only provider offering automated email sequences on their free plan (and their visual flow-chart makes setting them up a breeze). Some of the other providers have now followed suit and provide free automation too, although they may cap the number of emails you can send per month; with MailerLite, there’s no limit. One of the most effective ways to get traffic to your blog is to borrow someone else’s audience. In other words, by guest posting. 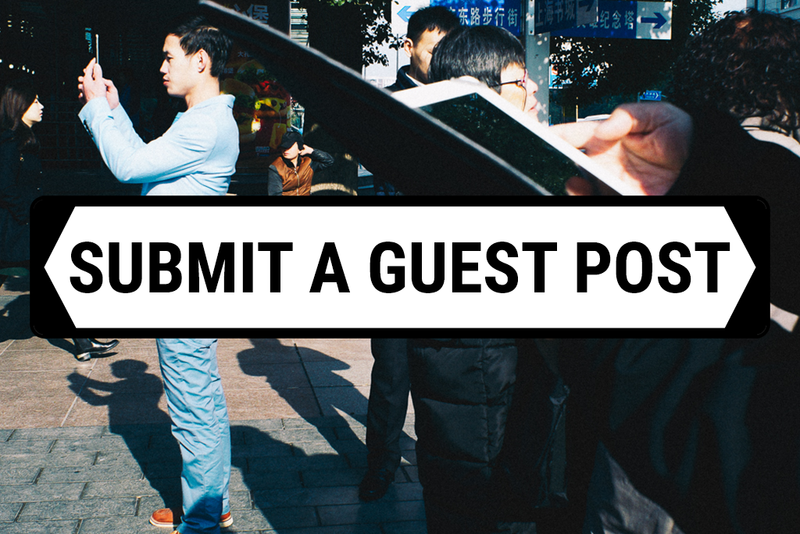 If your photography blogging style matches with what I’m doing here, you can always submit a guest post for consideration. Guidelines can be found here. The most important thing to have when submitting is your own photographs and a good story. You stand a good chance of being featured if you do. And if you shoot street or travel photography with vintage lenses or film as well, I’d especially like to hear from you. I know approaching other bloggers to ask if you can post on their blog can be intimidating. That’s why I wanted to make it easy for you to guest post here. Go check the page and see what you can come up with. Once your photography blog is set up and you’re adding good content to it and getting traffic, you might want to think about how it could earn you some money. The quickest and easiest way to do this is by adding affiliate links to products you’re already writing about and earn commissions on any sales they lead to. For most people, that means signing up for Amazon Associates. The program isn’t without its restrictions. The cookie window is short, the commissions are low, and you’ll have to sign up for each territory’s Amazon program to make money from them all. But for ease of use, the range of products available, and the level of customer trust it has, Amazon is pretty much unbeatable. Another huge online shopping platform that you can earn affiliate commissions from is eBay. The eBay Partner Network (EPN) may not be as commonly talked about as Amazon Associates, but it shouldn’t be ignored if your photography blog can take advantage of it. A lot of the vintage lenses and film cameras I talk about on My Favourite Lens aren’t available on Amazon, so I send people to eBay for them instead. For me, it works just as well as Amazon, and even has a lower payout threshold, which means you get your money quicker. If your photography blog features second-hand or vintage gear, I recommend signing up for the EPN. One problem with the Amazon Associates program is having to send your readers to their own country’s Amazon site to earn a commission. If you send a reader in the UK to Amazon USA and they have to switch to the UK site themselves, your cookie is lost; even if you’re signed up to all the separate Amazon associate programs. The same is true of the eBay Partner Network. Geniuslink solves this problem by automatically geo-targeting clicks made on your Amazon links to the Amazon site of whoever clicked it, meaning you won’t lose the commission. You can manually set it to do the same with EPN links too. Amazon and eBay do both have their own geo-targeting options, but they don’t cover every country. Only with Geniuslink can you achieve that. If your photography is good enough for you to blog about, then maybe it’s good enough for people to buy prints of too? There are several print-on-demand marketplaces you can sell your work on, but I stick to RedBubble and Fine Art America. Both of these sites are free to upload and host your work, with the only cost being the time it’ll take you to do so. They only print when somebody orders your work and take a percentage of the profit, making it another way to earn some passive income from your photography blog. If your photography is the type that people like to put on their wall, making it available on places like RedBubble and Fine Art America is really all upside, as far as I can see. As above, if your photography is good enough to blog about, why not make it available for sale as stock images? Again, there are plenty of places you can do this, but I make my work available on just two of them: Alamy and Picfair. As with the previous section, the only cost of making your work available for stock images is the time it will take for you to upload and keyword your work. Once that’s done, any sales will lead to passive income as the platforms take care of everything. Picfair allows you to set your own price, which is cool. However, Alamy has been better for me so far in terms of actual sales. When you’ve been blogging for some time, it’s nice to look back and see how far you’ve come since you began. Your photography will improve just by shooting, of course, but you can get even better if you actively educate yourself as well. Three eBooks that have helped me are Transcending Travel (which I reviewed here), Captivating Color (which I reviewed here), and Natural Light. All are published by Digital Photography School. Depending on the kind of work you do, you might get more value from eBooks on different topics. So it’s a good thing Digital Photography School have a whole range of others to choose from too. If you want to add something different to your photography blog, or even just your photography, I’d recommend trying a vintage lens. The best place to pick them up online is eBay, and you can click here to go browsing the vintage lenses they have listed right now. If you need some direction, I can recommend the Super-Takumar 55mm f1.8, the F.Zuiko 38mm f1.8, and the Minolta Rokkor 35mm f2.8 as some of my personal favourites. Alternatively, take the plunge and see what comes up by hitting the image below. You never know what vintage lens bargain you might find. If you do pick up any vintage lenses, you’ll need a camera with interchangeable lens capabilities to use it on. Obviously, Amazon will have you covered here. If you already have a DSLR, that will work just fine. However, if you need to buy something to use with your vintage lenses, I’d recommend a mirrorless camera instead. They’re a lot smaller, which is good when shooting with a small vintage lens, and the image quality is pretty much on par with DSLRs anyway – although you shouldn’t really be worrying about that if you’re shooting through vintage glass. The focus peaking feature on Sony models is great when shooting in manual focus, as you will be with a vintage lens, and FujiFilm are putting out some lovely cameras too. So, this is my list of photography blogging resources. If you’re just starting out and have been wondering how to start a photography blog, I hope at least one thing here has helped you. If you’re already blogging yourself, I’m sure you’ll have a few resources to recommend that I’ve missed. And if you think other people will find this useful, please share or pin it!